Ever receive gifts from a ghost? 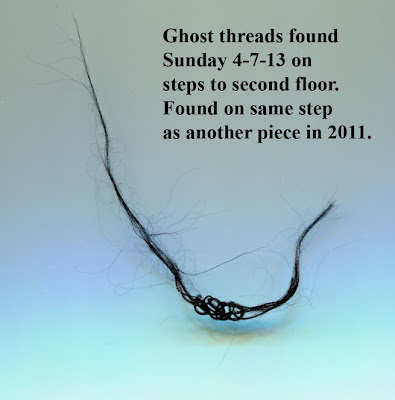 Previously,I wrote a blog on the subject of ghosts leaving people gifts of literally "Pennies from Heaven" or other coins to show that they are close by or to grab a loved ones attention. 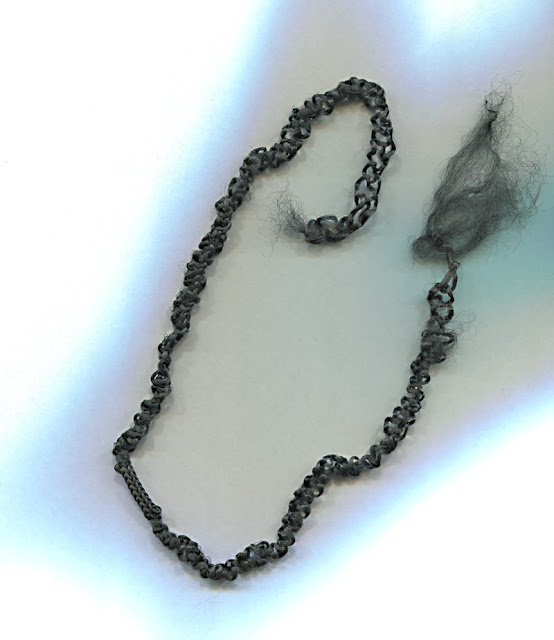 Besides coins can a ghost leave things behind such as a piece of jewelry, feathers or strings or ribbons in order to contact the living? 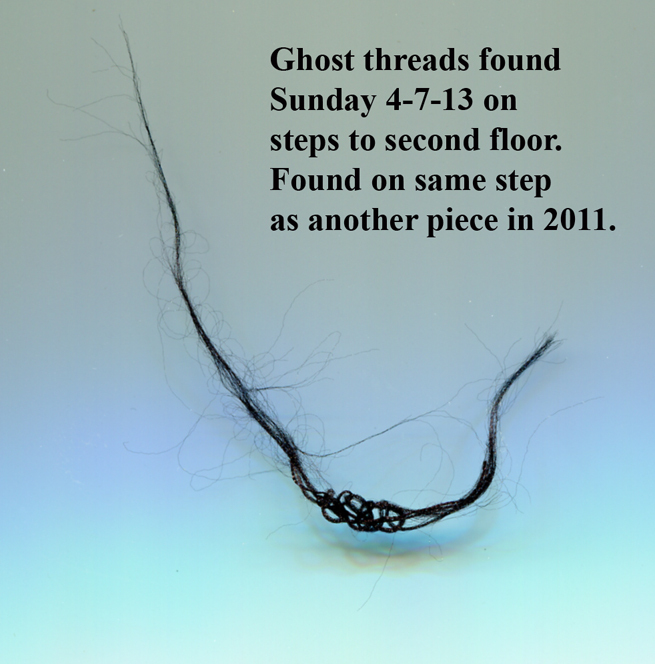 A dear friend of our family told us years ago after the untimely death of her grand daughter's husband they started finding feathers left throughout the house. It just wasn't a random feather here and there. They actually collected a vase full feathers! They were convinced that his spirit was there in visitation to let them know he was OK and leaving them a loving reminder to his wife and children that he was watching over them. This gave them comfort in the midst of their grief. Many times people don't pay attention to the signs; therefore, the spiritual realm will attempt to contact you through a variety of ways until you hear the messages. Sometimes the only way to get a persons attention is through moving an object or placing something in there path to make the person pay attention and listen to the message that is coming through. The Paranormal community states that the definition for this is:when a spirit can manifest a missing object or make an object disappear in one place and appear in another it is known as "apportation". An "apport" on the other hand, is when an object appears where none previously existed. There are 2 schools of thought and opposite opinions concerning this subject among professional psychics, mediums,spiritualists, ghost hunters and parapsychologists, etc. PRO - Angels, spirits, and God itself CAN manifest objects in a room. CON- Angels, demons and deceased human spirits CANNOT manifest objects out of nothing, because only God has true powers of creation. Their argument is that : Manifestation is not technically the same as creation. Because, spirits have no true powers of creation, they can only move around things that already exist or create objects out of things that already exist. 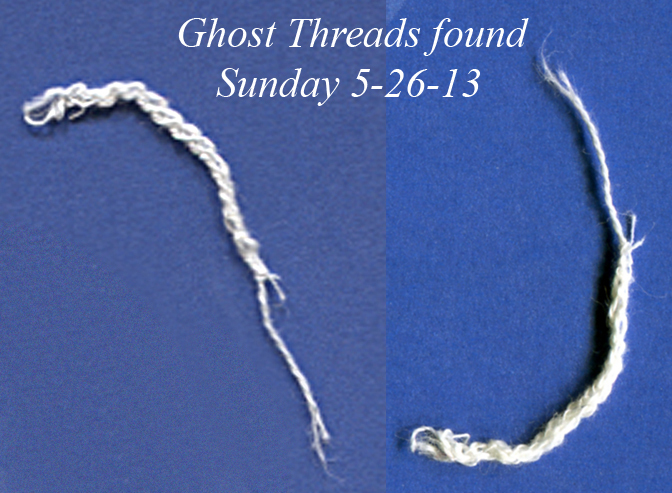 Mystery of the "Ghost Threads"
In 2010 several strands of plain blue treads were found on my son's art work station. At first my son thought I had left them as I sometimes do handwork near his art table.But these were not mine as I didn't recall having threads like these in my sewing box. They looked raw and unrefined as sewing threads. I didn't throw them away but placed them on our coffee table and the next morning I found the treads on our dark carpet had was astounded. They had been turned into a hand work of art! We thought this incredible and had no explaining for this. I carefully placed them in an envelope for safekeeping. Then a year later I received 2 more pieces within several days of each other. These were even more elaborate than the first. Always blue threads and of a type I do not own in the house although I use vintage threads to sew my doll outfits. They appear out of nowhere and suddenly and in the living room. I was walking though my living room to the kitchen and when I came back- THERE IT WAS-on the rug- where it wasn't a minute ago. Several days later while I was sweeping my stairs, I suddenly saw another piece appear before me on a step. 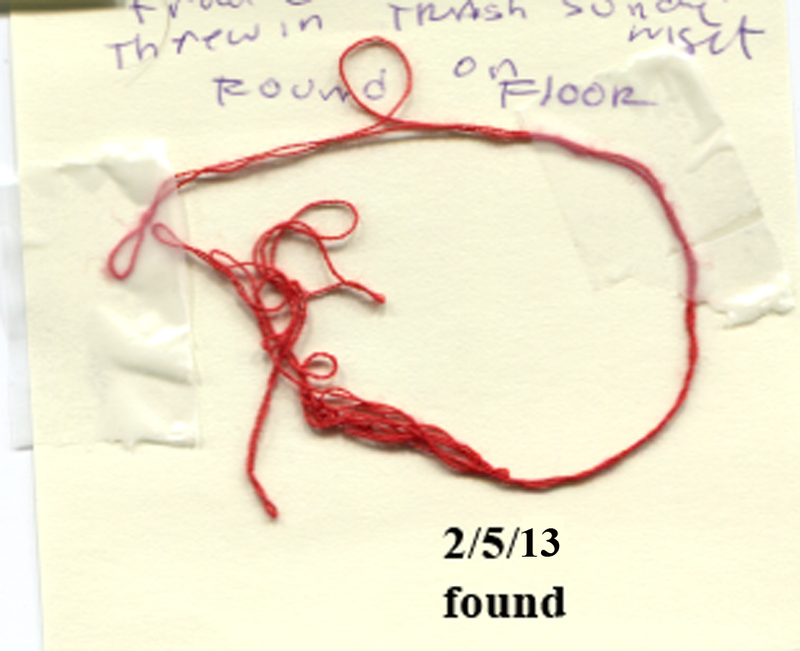 In February of this year I found a threaded piece this time RED, and it was in the upstairs bathroom. It seems my son clipped a long piece of red thread from his new T-shirt he was wearing and threw it into the trash can on Sunday night. 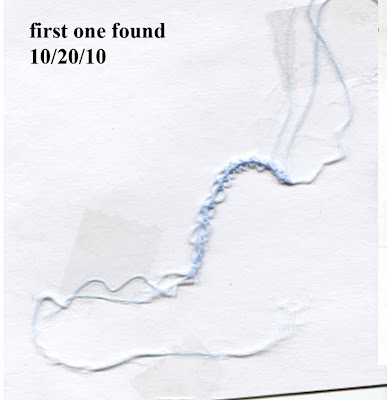 On Wednesday morning I found the thread on the floor-with the pattern worked into it. This was the very first spot we were made aware, by our visiting psychic team in Sept. 2012, that there was a lady present in the house as we smelled her scent of old fashioned perfume of roses and lavender. We will never forget that! Two weeks later my son called me (I was at my mother's house) on a Sunday night to tell me that I had another gift left in the upstairs bathroom. This time it was purple/gray threads. 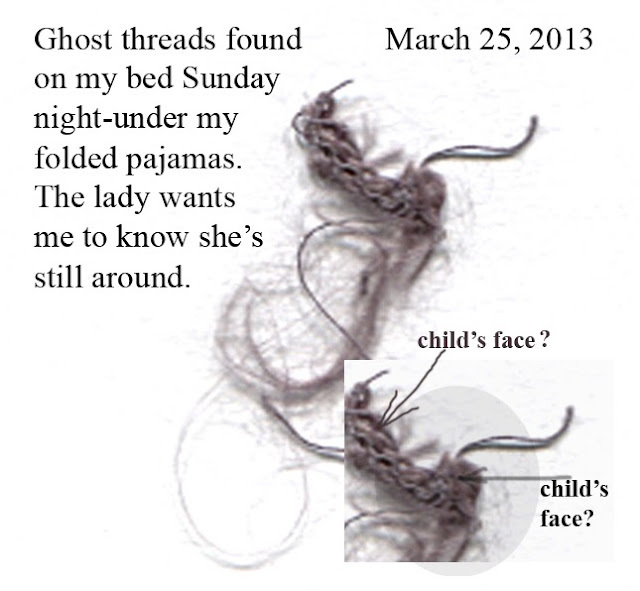 On March 25, 2013 Palm Sunday, I got a surprise under my PJ's on top of my bed! I showed this to my literary agent who emailed me back and said she thought she saw a child's face in the threads? I do see something-maybe because she made the suggestion? What do you think? 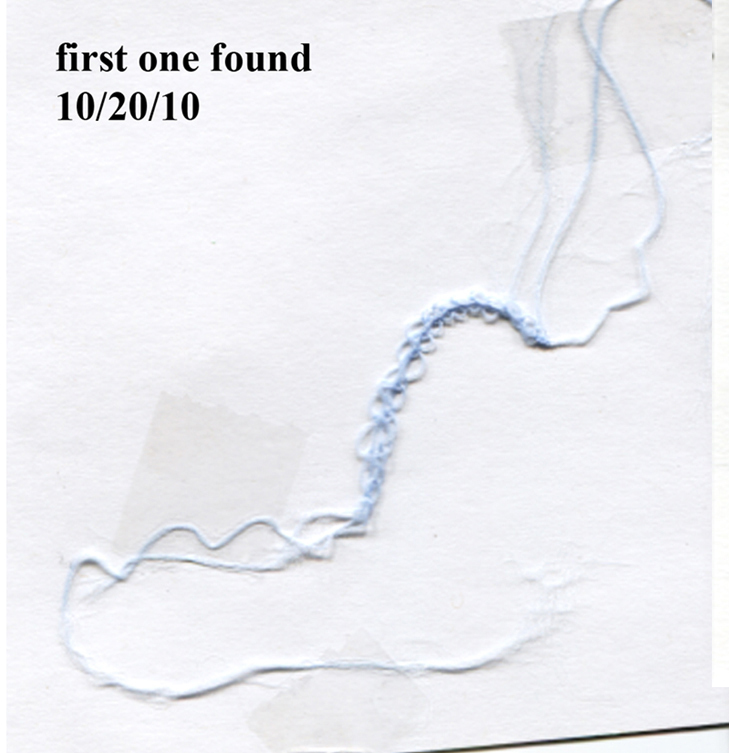 April 2013 Another Sunday my son called me once again to let me know a gift was left on my steps much like 2 years before.This time color was black- and looked like an eternity knot in the thread? May 2013 This was found outside the doorway to my studio. This was of a cotton material. August 2013 This was the most elaborate gift I've received and it was found outside my breezeway door. I hadn't received any threads for several months and was surprised and startled to see how long this piece was. The pieces in the past have been several inches in length, very delicate. 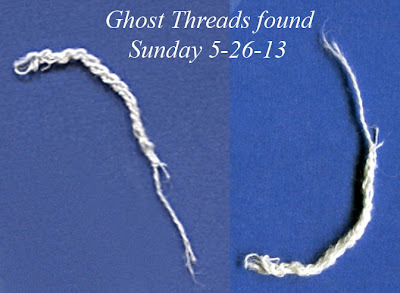 This was made of a heavier silky type thread and 12 inches long! When these "gifts" are given perhaps the spiritual realm is trying to get your attention. It may be a departed loved one, an angel, guide, or some other spiritual being who is attempting to pass a message along to you. Talk to them out loud, thank them and let them realize you are aware of them. That is usually all they want. I wasn't sure what this all meant by receiving these gifts but I've been told by several psychics that these gifts are a way for the Lady ghost to connect with me as she is deeply attached to me. I am a artist and creative person who does hand work and have been a care giver to my parents. Apparently the lady was a governess or a caregiver to the children who once lived here on the property (as we also have children spirits here that are sometimes quite active). From my experience it is possible to receive gifts from ghosts. Whether the ghost created the gift from nothing or just manipulated an object into something else, will always be a matter of debate. But it is still an extraordinary thing to happen to you and I feel unbelievably privileged. I have lived in a haunted house for 20 years. I have had many strange and sometimes scary incidents. I have also received gifts. First one was a small jewelry box. I opened it up and there was a $20 bill sitting on top of paper towels. I opened up the paper towels and then found 2 pairs of old fashion clip on earrings. It sat on my coffee table to 2 days and then disappeared and no one has seen it again. About a year ago a very nice fork appeared in my kitchen drawer. Very expensive, heavy, well made. Never saw it before. About 1 month later a matching spoon arrived and then a few weeks later another matching spoon. The manufacturer was engraved on the back and I looked them up on the internet and it turns out these particular pieces of flatware are very expensive. $1200 for a 5 piece place setting. 13 black used buttons 1 white unused button. Any ideas?